When it comes to food, Americans seem to have a pretty great deal. Our grocery stores are overflowing with countless varieties of convenient products. But like most bargains that are too good to be true, the modern food system relies on an illusion. It depends on endless abundance, but the planet has its limits. So too does a healthcare system that must absorb rising rates of diabetes and obesity. So too do the workers who must labor harder and faster for less pay. Through beautifully-told stories from around the world, Kevin Walker reveals the unintended consequences of our myopic focus on quantity over quality. A trip to a Costa Rica plantation shows how the Cavendish banana became the most common fruit in the world and also one of the most vulnerable to disease. Walker’s early career in agribusiness taught him how pressure to sell more and more fertilizer obscured what that growth did to waterways. His family farm illustrates how an unquestioning belief in “free markets” undercut opportunity in his hometown. By the end of the journey, we not only understand how the drive to produce ever more food became hardwired into the American psyche, but why shifting our mindset is essential. It starts, Walker argues, with remembering that what we eat affects the wider world. If each of us decides that bigger isn’t always better, we can renegotiate the grand food bargain, one individual decision at a time. "Walker's The Grand Food Bargain provides an antidote: a thoughtful analysis of how the food system got into this mess...Walker reveals a disturbing political, social and economic landscape...The drive for more, he shows, demands profligate use of finite resources, from energy to land...His diagnosis has been articulated before...But Walker's experience in agribusiness adds authority...Walker left with the bubbling anxiety that our focus on technological and scientific fixes blinkers us to the environmental cost of our greed. Ignore the irrevocable laws of nature for long enough and we put our own, rather narrow, ecological niche at risk." "Former farmer, agriculture and agribusiness expert, and professor Walker reveals the truth about this presumed never-ending food abundance...Ultimately, Walker emphasizes the fact that people do have the power to shift the scales back to quality food choices, which will positively affect farming, economic development, and the environment around the world. An enlightened view of global food policies and the changes necessary for a viable future." Christopher Leonard, author of "The Meat Racket: The Secret Takeover of America's Food Business"
Marion Nestle, Professor Emerita at New York University and author of "Unsavory Truth: How Food Companies Skew the Science of What We Eat"
Paul Terry, CEO and President, Health Enhancement Research Organization and author of "Well-Advised: A Practical Guide to Everyday Health Decisions"
Chapter 12. To Lead or Be Led? We have fashioned a world where being surrounded by unending food seems normal. When we feel hungry, we open cupboards, look in refrigerators, or stop at any number of nearby restaurants or supermarkets. Our food system is built on an illusion of endless abundance, but the planet has limits. We spoke with Kevin D. Walker, author of The Grand Food Bargain and the Mindless Drive for More, to discuss the unintended consequences of our myopic focus on quantity over quality. Read his insights below, and don’t forget to pick up your copy of The Grand Food Bargain. Booklist has called it, “An enlightened view of global food policies and the chances necessary for a viable future.” Have more questions for Walker? Share them in the comments below. What is the grand food bargain? What are its costs? The grand food bargain marks America’s transition from a nation of farmers to a newfound class of consumers, one no longer bound to farming or having to produce their own food. In the deal, consumers receive more food for less effort and food producers profit by selling greater volumes of food. The grand food bargain, which plays out millions of times each day, dominates how we relate to food and reinforces a “having more is always better” mindset. Visible costs of the grand food bargain include chronic food-related disease ranging from heart disease to obesity to cancer; wasted farmland, petroleum, and water resources; loss of diversity in nature; and erosion of the environment. In food safety, large multistate food distribution networks double as pathogen superhighways facilitating widespread foodborne outbreaks. There are less visible costs as well. In the United States, for example, the quest for efficiency has hollowed out much of rural America and left behind diminished economic opportunity. What’s at stake if we don’t change? Our inability to sustain abundance. It took more than two million years for humans to find a way to replace food scarcity with food abundance. In the century and a half since, abundance has been followed by glut, and glut has been followed by needless food waste. That waste now undermines the very forces that gave us abundance. When we look at the arc of human life on Earth, this brief moment of readily available food is not a guaranteed state but an aberration in time. The path we are choosing through our behaviors foretells a return to scarcity. In the book, you describe how people’s relationships to food has changed over time. Why is a historical perspective necessary to shape a better food future? I bring in history as a reminder to not take food for granted. I grew up surrounded by mountains, some of which I scaled to the summit. What took hours of effort to ascend, required almost no effort and time to descend. Had I been helicoptered to the summit, I would not have gained the same appreciation of all that was required. Food is no different. From history we learn what it requires to be on the summit. This includes recognition of once-living beings whose entire existence teetered on survival and a life-enabling environment. Their existence, forces of nature, and favorable circumstances outside our control made it possible. But what becomes of us going forward depends on whether we recognize our fortunate circumstances enough to preserve it, starting with not taking food for granted. What did growing up on a farm teach you about the food system? I learned how powerful yet precarious the food system can be. In the valley where I grew up, as reliance on food turned to supermarkets and restaurants, the connection between land for growing food that consumers would eat disappeared. People sought after prime farm land to build homes on. Municipalities were in support of this as farmland turned into developments generated additional tax revenues. The food system made it easy to believe that more food came from spending more money. Meanwhile, while working on the farm, I learned that no matter how hard we worked final outcomes were never guaranteed. Food we grew was always subject to forces outside our control. Any doubt of this was removed one cool and slightly breezy October day when our haystacks caught fire, sending all of our hard work the previous spring and summer months bellowing skyward in dark plumes of black smoke. Indeed, nature and the environment are not beholden to people, including what we invent and label a food system. Your book begins with a trip to the Kalahari Desert. Why was that experience so pivotal to your thinking? The Bushman’s response to stark scarcity of food in the Kalahari reinforced how the role of food in our lives is a matter of life and death. In contrast, our westernized food culture remakes this relationship to be transactional—one where satisfying individual tastes is exchanged for money. What’s left out of this equation is how we dismiss food scarcity as an artifact of the past by ignoring how food and natural resources are wasted, and the toll our actions exact on nature and the environment. Watching the Bushman select a single egg then leave behind the remaining eggs (which were free for the taking) made a lasting impression on me, especially since there were no guarantees that the life inside each shell would survive. As I learned about the harsh environment of the Kalahari, thought about how each of us traces back to ancestors who were likewise hunters and gatherers, and reflected on other experiences, my understanding increased as to why our westernized approach to food beyond what we eat has faltered. Unlike the Bushman with their sense of how food, their lives, and the natural world were bound together, our perceptions have become more fragmented. In our world, food begins and ends at supermarkets or restaurants, and thoughts on how everything is intertwined are quickly supplanted by abundance and convenience. Ostrich eggs in a nest. Digitally reproduced by the USC Digital Library; From the California Historical Society Collection at the University of Southern California at Wikimedia Commons, Link. Are you hopeful that Americans can start prioritizing food quality over quantity? Why or why not? Yes, enough so to spend countless hours writing a book specifically for eaters of food. In the beginning of the grand food bargain, eating more food meant improved nutrition, and by extension, better health. But people can only eat so much and how to unload excess food (calories) soon became the food industry’s most vexing problem. What the United States does better than any other country is mass produce food calories. Designing, labeling, and marketing foods dense in calories as convenient and purportedly nutritional, became the “perfect formula” to pushing quantity over quality. While writing this book, I remember realizing how this formula combines our ageless biological drive to survive by eating and storing calories whenever possible with changing cultural norms that heavily favor convenience and eating whenever possible. Unsurprisingly, not succumbing to overconsumption of calories has been a daily struggle for most Americans ever since. But after decades of battling weight gain and poor health, people are primed to question and redefine their expectations of the food system. It’s already happening in the consumption of sugary soft drinks where year over year sales of soda in the United States have been declining for over a decade. For many people in America, their thoughts about food are simple – what can I afford to buy that is healthy and convenient? Why should they care about the grand food bargain? When considering price, nutrition, and convenience, which two factors are most important? Early into the grand food bargain, all three worked together in favor of consumers. Not anymore. Today, what is labeled and marketed as “food” can obscure how much is nutrition or “empty calories” that are steeped in added sugars and fat. The vast majority of food products stocked in stores cater to price and convenience, though they are often calorie-dense products dressed up and labeled to appear nutritious and healthy. Many consumers opt for price and convenience while rationalizing away personal health. What were once conveniences like precut chicken parts, or already prepared dishes, are now regarded as necessities. Today’s consumers spend the vast majority of their food dollars on conveniences—everything from having food neatly packaged, prepared, preserved, and delivered to a nearby store open at all hours, to having others serve food on demand and then clean up after them. For those with budgets, the food system has made it easy to choose any two but not all three. Consumers are left to decide which two of the three are most important. In my own household, recognizing this attribute about the food system has brought clarity to choices we make. Most of our supermarket food dollars are spent on produce. We try to avoid the center aisles in supermarkets. If the food in question contains a detailed ingredient list while boasting of improving health, it’s likely neither nutritious nor healthy. Processed foods advertised as low in fat are often high in sugars and vice versa. What we give up in convenience and added time in the kitchen, we make up for in better nutrition, and by extension better health. Nowhere is the refrain “there is no such thing as a free lunch” more applicable than with food itself. The calories in foods high in added sugars, fat, and salt are as close to free as they have ever been. In contrast, food-related diseases and medical treatment have never been more expensive. You argue the world produces too much food. Why doesn’t that excess go to feed the hungry? A better question is: why does the world unnecessarily waste so much food? One reason why excess does not feed the hungry is because modern food systems create food availability for those with the financial means. However, availability of food is not the same as having access to food. For the most vulnerable, the issue is not availability but rather how to gain access to the food system with little or no money. In America, lack of access to food, once thought of as temporary (such as the loss of a job), has become more insidious and structural, thanks in large measure to an economy that increasingly favors low wage jobs. Behind this shift are policies and practices that promote inequality, uneven economic growth, and incentives that keep elected officials and businesses from changing the status quo. Food waste. Photograph: Murdo MacLeod for the Guardian. Link. How can consumers best vote with their time and wallets? Is it avoiding fast food? Choosing organic? Joining a co-op? Awareness and focus are key. Before precision guidance systems became optional equipment on tractors, I learned from my father that planting straight rows of crops started with picking a target in the distance then keeping focused while steering towards it. In considering food, that target is remembering that our relationship to food in life is never neutral—what we do carries outcomes, for ourselves, the people around us, the environment, and those who will follow after us. This conscious awareness generates voting opportunities. For instance, we do better by striving for greater harmony with nature and the environment versus setting out to control them. Growing public dismay with antibiotics in food production have prompted questioning of what was once acceptable behavior. Through individual choices, people are voting against them, particularly in poultry and pork production. This awareness has helped parse out propaganda from bona fide commitment to stop usage. Among the larger companies, at least one is on record as no longer using antibiotics. When it comes to pesticide residues in produce, changes are also happening. While multiple trace residues (reportedly below maximum permissible levels) still show up in produce like apples, peaches, strawberries, and tomatoes, others such as bananas, oranges, broccoli, and sweet potatoes are reporting fewer residues and sometimes none at all. Organically produced food holds another opportunity, but here again, awareness is crucial: as organics gain traction, the pressure to redefine organic standards rises. Simply basing actions on labels may not suffice. The same holds true with the efficacy of sustainability labels, such as with seafood as I detail in the book. Drawing closer to local food production affords another alternative to cultivate awareness, not to mention other benefits like taste, freshness, and conserving finite resources. In my travels, I observed how some Europeans haven taken this to the next level. Farmers’ markets are often three times a week and block off entire streets. Some community garden plots are outfitted with permanent sheds, picnic tables, and shade cover that can be passed down generationally. By letting ongoing awareness guide our actions, instead of being subservient to what the food system offers up, we are in the position to adjust our behaviors and vote accordingly. A lot of smart people are working to reform the food system. Are they on the right track or is there something different they could do to overcome the current barriers to change? Efforts to reform the food system are laudable, but expectations that it come from those within the system will disappoint. As one example, when a joint USDA and HHS dietary advisory committee said a more plant-focused diet is better for health and the environment, their recommendation was rebuffed by both secretaries as outside their mandate. Such a recommendation threatened the status quo. Reform that relies on breakthroughs in science and technology is also a downward spiral. If we think about it, some of the most ominous threats we face like growing resistance are the result of past advances in science and technology. While we still need science to advance our understanding, ultimately, it’s up to eaters of food to make informed decisions and not fall prey to promises wrapped in science as saving us from our own actions. Quantum dots and so called “clean meat” are two of the latest examples. When individuals are no longer willing to accept what were once reasonable behaviors, the collective will of the people changes and governments and businesses fall in line. For those hard at work trying to change the system, they would do well to reinforce the connection between behaviors and outcomes, not just for their particular area of focus, but across the entire food system. Helping to articulate that our connection to food extends far beyond what we eat was the reason for writing this book. By illuminating how the food system operates, readers now have the perspective to endorse or challenge what they are willing to accept or reject. I had a number of “a-ha” moments during this process. Aside from what is detailed above, I also realized how much America relied on social norms to produce food for more than two and a half centuries. This happened at a time when most elected officials came from farming backgrounds, agriculture dominated the economy, and there was more hunger, more-frequent crop failures and far less knowledge of nature and the environment. Notwithstanding these challenges, food production continued to grow and government aid and subsidies were practically null. I also recognized the value of seeds upheld by the country for close to two centuries. Seeds for producing food were regarded as the bedrock of life and were not allowed to be patented, as they who controlled seeds also possessed the power to control life. Such power has now been concentrated in the hands of three multinational corporations. It also became clear that we always do better living in harmony with nature and the environment than trying to presume control over them. As proof, there has yet to be an antibiotic or pesticide invented that nature has not adapted to resist. We have fashioned a country where being surrounded by unending food seems normal. When we feel hungry, we open cupboards, look in refrigerators, or stop at any nearby restaurant or supermarket. Over time, this system has encouraged us to know less about where our food comes from and permitted us to expect more food with less effort. 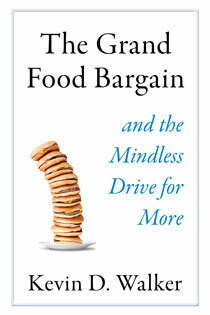 Kevin D. Walker’s The Grand Food Bargain and the Mindless Drive for More shatters this illusion of endless abundance. With this book, Walker cements himself as one of the most remarkable food writers of our time and provides a powerful look at the global consequences of America’s modern food system. The result is a stunning indictment of a system that prioritizes volume over nutrition, low costs over livable wages, and blinds consumers to harmful effects ranging from polluted rivers and food waste to obesity and disappearing species. A master storyteller, Walker takes readers around the world, from the Kalahari Desert to a Costa Rica banana plantation to craft a sweeping history of our relationship with food. By the end of the journey, we not only understand how the drive to produce ever more food became hardwired into the American psyche, but why shifting our mindset is essential. Walker’s seminal book shows that if each of us decides bigger isn’t always better, we can renegotiate the grand food bargain, one individual decision at a time. Check out Chapter 4: An Infinite Supply of Finite Resources below, or download the PDF here. Chidinma is our web and social media intern.